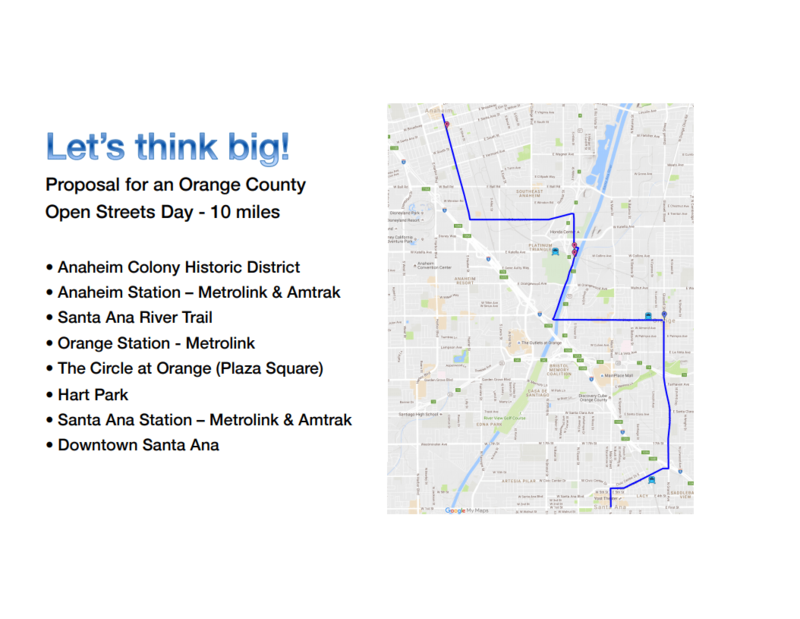 “If you ask the folks in South Orange County, they say we’re not having equity, [we’re] investing $350 million in the streetcar in Santa Ana. Where’s our $350 million? You can’t be serious . . .
Let’s back up. 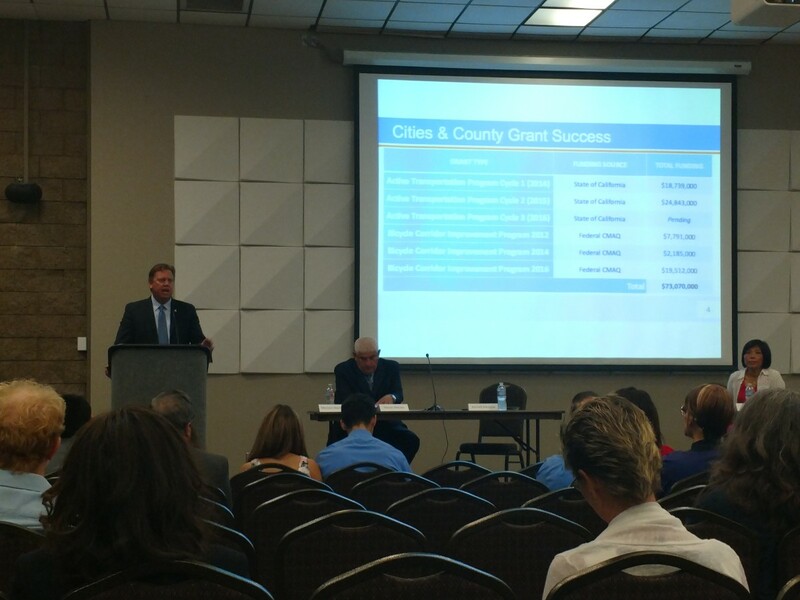 I was attending October’s Orange County Active Transportation Forum in Garden Grove when Darrell Johnson, CEO of Orange County Transportation Authority was giving his piece of mind about equity. It was the first session of the morning, and leaders from other agencies including the Orange County Council of Governments, Southern California Association of Governments, and Caltrans shared the stage with Johnson. The whole talk was pretty optimistic stuff: Caltrans District 12 Deputy Director of Planning Lan Zhou talked about their efforts to create an Active Transportation Plan, SCAG Executive Director Hasan Ikhrata showed off the local results of its GoHuman campaign in Westminster and Garden Grove, and OCCOG chair Marika Poynter presented its OC Complete Streets handbook — a resource that was created to help cities implement Complete Streets ideas in design and policy. Johnson’s presentation honed in on OCTA’s effort to make streets more multimodal. He highlighted the more than $73 million OCTA received from federal and state funds for bicycle/pedestrian projects, the 60 percent completion of the 500-mile Regional Bikeways Network, and the agency’s planned start next year on a countywide active transportation plan. Yet, it was a question from Marina Ramirez, a Santa Ana resident and member of Santa Ana Active Streets Coalition, that put the CEO on the defensive. I think it’s important to talk about the big picture for the moment and then narrow it down. We live in a county with 3.2 million people, and based upon the plans that are submitted to OCTA and through SCAG about the future, over the next 20 years through no doing of OCTA, what we’re told is that we’ll see housing (prices) increase by 13 or 14 percent. Population will increase by about the same and jobs will increase by about the same. When you model all that together we see congestion in our county at all modes increasing by about 165 percent. So, I look at my job is to figure, our job is to figure how do we address the 165 percent. That’s going to take a whole variety of things. That’s going to take better bus services, better streetcar service, it’s going to take better Metrolink service, better Active Transportation. But there’s no one size fits all, so we want to work through that in any given manner. Someone asked me, well, what if you’re wrong, what if it’s not 165 percent. Well, even if we’re half right, and it’s only 85 percent, that’s a lot of congestion to sort of deal with. So we’re trying to look at all these different toolboxes with that. A recent example is the City of Santa Ana has asked us to look at some removal of lanes on a highway* (they call streets not on freeways, highways, yup). So unintended consequences, this idea of taking out a lane in traffic and replacing it with active transportation is an idea that they have, it’s an idea we’re not opposed to, but an unintended consequence is the severe impact on the frequent of transit service on that corridor, bus transit service. So when we’re taking people that are used to riding the bus, making a trip from point A to point B in 30 minutes and because of the increased traffic congestion, reduction of lane, not being able to get to the near side, that 30 minutes becomes 90 minutes or 80 minutes. So we’re working through that so we can understand all users there and how do we look at opportunities for sharing and looking at opportunities for making sure that there’s not winners, there’s not losers. So there’s push and pull on that. I’m not even talking about automobile traffic, that’s an obvious. But this idea that bus transit users which are a very important constituency in the urban part of our county, how do they not get a part. As far as equity, everyone has a very different definition of equity. If you ask the folks in South Orange County, they say we’re not having equity, you’re investing $350 million in the streetcar in Santa Ana. Where’s our $350 million? When you’re asking people in Santa Ana about the streetcar, what that means is issues around property . . . those are market driven issues that will be what they will become. We’re working hard to ensure that when the construction activities occur that the businesses and community know what they are, then the built-in becomes a part of their community. And there’s been broad broad support in Santa Ana and Garden Grove community for this next step and looking at what that is. So we’re trying to accommodate the needs of the current and the needs of the future. But what I would also say that in closing, I think the urbanization of our County is changing regardless of whether there’s a streetcar project there or not. And those issues around property valuations, and property taxes, those are going to be there regardless. This may accelerate it in some way, but it’s going to occur no matter what. Anaheim residents were an active voice throughout the forum. Youth from Anaheim High School that were a part of AHOC’s Active Transportation Leadership Program were vocal about displacement, whether it was about housing or adaptive reuse projects. It is every city’s goal to increase rents because it means high property values which means more property tax revenue which means more money for police and schools. Organizations like the Bus Riders Union campaigned successfully against Measure J in 2012 because “trains are for white people”, the same rhetoric killed ACT’s light rail plans up here in the Bay Area. It’s classic NIMBYism but under the guise of social justice. The people whining about “displacement” are regressive and shouldn’t have a stake in the conversation. What holds true for farmers outside of Merced holds true for inner city renters. The needs of the many far outweigh the desires of the individual. All this nonsense about removing traffic lanes and emphasizing transit used by less than 3 percent of the population ignores the reality of living in southern California. Check it out http://www.telegraph.co.uk/news/2016/11/23/worlds-worst-traffic-jam-cars-stuck-thanksgiving-getaway-gridlock/ and remember this was on the Tuesday before Thanksgiving.